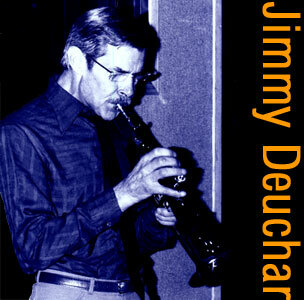 Jimmy Deuchar CDs @ Hep Records, jazz in depth from the 1930's to the present day. Jimmy Deuchar is arguably the most important Scottish born jazz musician ever. He was an 'enfant terrible' of the trumpet in the early fifties and in short order became a composer and arranger of international stature. On being demobilised from his national service with the RAF in 1951 he joined the Johnny Dankworth Seven and quickly gained notice. Throughout the 50s he worked and recorded with the cream of the London Bebop generation including Jack Parnell, Ronnie Scott, Derek Humble and Tubby Hayes. He was invited to join Kurt Edelhagen's Orchestra in West Germany possibly at that time the most prestigious continental orchestra. Then he became an important arranging and instrumental part of the Boland-Clarke multi national Orchestra based in Germany. His unique trumpet stylings were originally based on careful listening to leading American boppers like Navarro, Dorham, Brown and early Miles Davis. His writing although also highly individual did have a genesis in Tadd Dameron's work of the late forties and early fifties. He returned to Scotland in the late 70s and continued to write for the leading European Orchestras and also for the Glasgow based BBC Dance Orchestra. In 1979 he toured with his old friend and employer Jack Parnell in company with another gifted Scottish jazzer-tenor sax man Gary Cox. The tour led to the "Scots Connection" recording. He was commissioned by Hep Records to arrange a full string section for Spike Robinson's "The Gershwin Collection" and also to write a series of orchestral pieces for fellow Scot and ex Parnell bandsman baritone saxist Joe Temperley on "Concerto for Joe". These were recorded for Hep. There are many recordings he made as a side man with various bands and several in the fifties under his own name on the Tempo label but far too few for a man of such gifts. His later years still based in Scotland gradually were made difficult by ill health but his writing continued undiminished. He died 9th September 1993. Jimmy Deuchar - "Points North"